Historian and author Major General Julian Thompson explores the circumstances that led to the beach rescues of 1940, the story of which is being told in Christopher Nolan’s epic new war film, Dunkirk. The evacuation of British forces from Dunkirk in June 1940 is one of the pivotal moments in the Second World War - an astonising endeavour that snatched victory for the Allies from the jaws of defeat. Here, and in his book, Dunkirk: Retreat to Victory, historian and author Major General Julian Thompson explores the circumstances that led to the beach rescues of 1940, the story of which is being told in Christopher Nolan’s epic new war film. At 3.40 am on 4 June 1940, as the grey light of dawn began to lighten the sky through the heavy pall of smoke that hung over Dunkirk, the Shikari, the last ship to leave, slipped from the East Mole. The rattle of German machine-guns close by, marked where the French rear-guard still gallantly held off the Germans. Having already completed several trips, Shikari was one of the Royal Navy’s oldest destroyers. Later that day, the Admiralty in London sent the signal ending Operation Dynamo – the code word for the evacuation from Dunkirk. Evacuating the British Expeditionary Force (BEF) from France following three weeks of a fighting withdrawal was made necessary by the collapse of the French and Belgian armies on either side of the BEF. The alternative was to join these armies in surrender, but, instead, between 27 May and 4 June, 338,226 soldiers were taken back to Britain to fight another day. Because it was thought that only 45,000 soldiers might be rescued, the evacuation of the BEF was spoken about as a miracle at the time, and is still depicted in those terms by some to this day. The only miraculous element in the operation was the weather: gales and high seas would have allowed far fewer troops to be taken off; probably none from the beaches, and drastically less from the seaward side of the East Mole. The Dunkirk operation owed its success to the power and skill of the Royal and Merchant Navies, not to any mystical intervention. The cost was high. Of thirty-eight destroyers, six were sunk, fourteen damaged by bombs and another twelve by collisions. Nine merchant vessels were sunk, and eleven damaged. Although the soldiers of the BEF claimed not to have seen the RAF overhead, they were there. The RAF flew 3,561 sorties in support of Operation Dynamo, losing 145 aircraft, of which ninety-nine were fighters, including forty-two Spitfires. The Germans lost 132 aircraft to Fighter Command who were thus thirty-three ‘kills’ ahead by the end of the battle. Like so many events in war, the Dunkirk evacuation has its share of myths. The most powerful being the part played by the ‘little ships’. The facts are that over two and a half times as many troops were taken from Dunkirk harbour than from the beaches, and of those taken off the beaches, the majority were transported in destroyers or other ships, albeit in many cases ferried out to these larger vessels, either by ‘little ships’, or ships’ boats. The number of men taken directly from the beaches to England by the ‘little ships’ was small. This is in no way to denigrate the courage of the civilian crews of the ‘little ships’. As well as their considerable direct contribution to the success of Dynamo, their deeds provided a much-needed fillip to morale in Britain at a desperately dangerous time in our history. 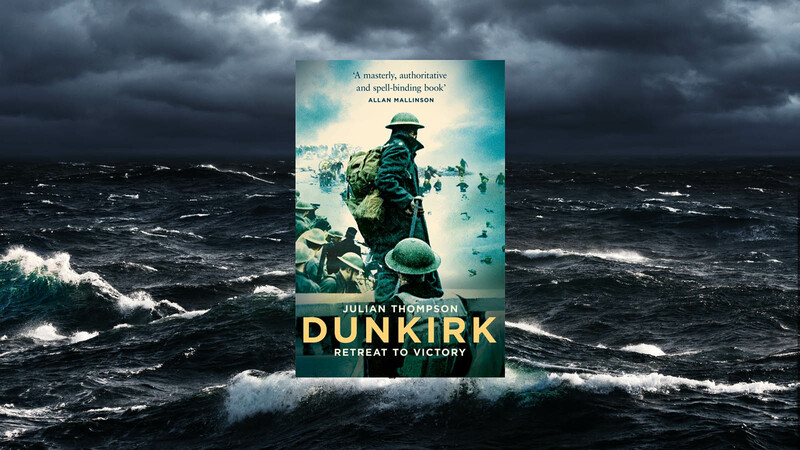 In Dunkirk: Retreat to Victory, Major General Julian Thompson recreates the action as the British fought hard for three desperate weeks in 1940, conducting a successful fighting withdrawal in the face of a formidable foe. He describes the individual acts of bravery and sacrifice and analyses the decisions of the commanders who made the choice to evacuate. He also takes us to Dunkirk harbour and onto the beaches, where the British army was trapped and under attack, while the Royal Navy and the 'little ships' raced against time to rescue them.